Last Gasp: Draw a card. If Telvanni Catspaw was sacrificed, draw two cards instead. 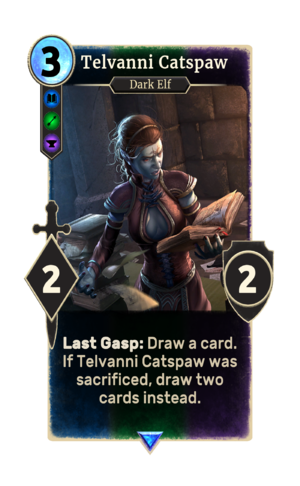 Telvanni Catspaw is a rare House Telvanni creature card. It is part of the Houses of Morrowind expansion. "Must I do everything myself?" This page was last modified on 2 March 2019, at 00:42.